When she was younger baby liked to look in the mirror. Now we get to see baby smiling in the mirror. While Arya still likes looking at herself in the mirror, she has yet to smile at herself. Rather, our baby smiles in the mirror whenever she sees Mommy or Daddy looking back at her. There are many reasons why babies love mirrors. In the case of our daughter, she primarily uses the mirror to look at things she is unable to see. Baby has been able to move her head for months now, but since she still can’t rotate herself she is stuck with a 180 degree field of view. With a mirror propped in front of her Arya is able to look at much more. 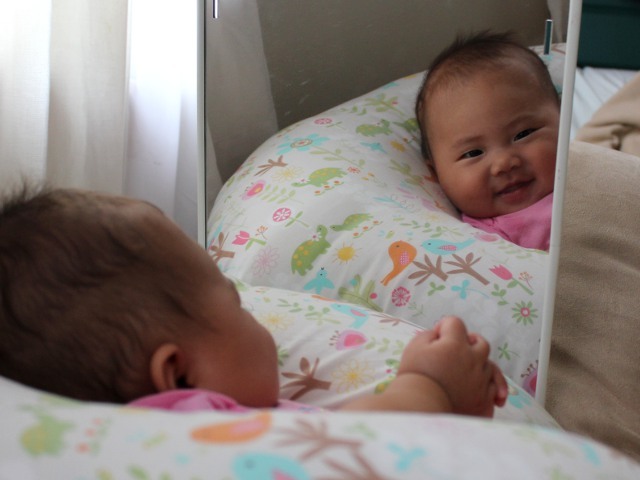 Since she often gets bored (despite having many books and toys) when she is at home, a baby mirror is an easy way to temporarily distract her. Arya also enjoys looking at herself in the mirror. Strangely, while she is very sociable with other people, she rarely reacts when looking at herself in the mirror. She will, however, smile at either Mommy or Daddy if we make eye contact in the mirror and smile at her. Our double-sided mirror is designed to be hung from her crib. But our baby actually likes it more when we prop the mirror up near the couch armrest and let her look at it from a seated position.